Kid's Party, Melbourne, reptile party, Melbourne kids. kid's party ideas Melbourne, Melbourne's best kids reptile party. kid's party ideas Melbourne, Melbourne's best reptile party. Why is a Snakebusters kids party better than others? - Ours are the ONLY hands-on reptile parties, where kids hold the animals. All others are "show and tell" only. - Our staff have most expertise. - We're the only ones with the world's Deadliest Snakes (Devenomized) - Zero Risk! (see below). - We've got more reptiles than any other kid's reptile party. - We're the most educational kids reptile party. - We have better "extras" than any other kid's reptile party. - We are the most fun! or, (see the link for all shows and party), but the main thing that people notice is that our kids party is full-on "hands-on" as in usually everyone holds pretty much everything - AND - without waiting. Lots more critters at a time at our kids party and kids can hang onto their reptiles rather than handing them on, because we bring enough for everyone to hold at the same time! We bring dozens of critters! No other kids party with reptiles comes close! Deadly snakes that don't bite (another Snakebusters exclusive), harmless snakes, monster pythons, lizards, crocodiles, tortoises, frogs, a birthday gift that isn't junk, etc ... we bring the lot to our kids party! Pricing is usually $400 per kid's party (Melbourne metro, 2019). And with Snakebusters you get the extra's without paying extra! Snakebusters are alone in Melbourne in not quoting surcharges for Crocodiles, no more dollars to bring the deadly snakes, not quoting extra for extra kids above some miniscule number (no limit on kids at our party!) and free kids party invitations (see links here). It is best to phone us (day or evenings are OK), rather than send an e-mail. We don't get all e-mails sent and don't necessarily respond to them straight away. 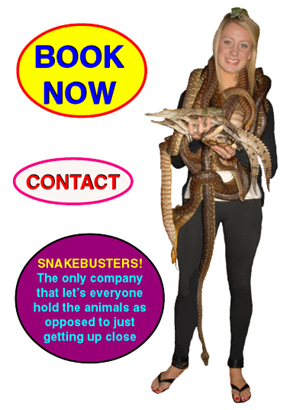 More importantly, as Melbourne's most sought after kid's party and wildlife demonstrators, we are always heavily booked, so it is best to book Snakebusters before sending out your party invitations and the like. Further details: Phone in Melbourne, Victoria (03) 9812 3322 or mobile - (within Melbourne, Victoria, Australia) 0412 777 211. (or questions worth asking if shopping around for kids reptile party or hands on reptile display in Melbourne). Return to the Snakebusters main website entry for school incursions for children, events, shopping malls, adults parties, corporate training and events, consulting, snake catching, scientific research and publications, film, TV, etc. Snakebusters booking and contact page. 1 - Snakebusters are alone with Victoria's only legal venomous snake show, because only Snakebusters have the expertise to have vet certified surgically devenomized snakes, for your guaranteed safety and the welfare of the snakes. We don't belt ours around with sticks and tongs. 2 - Snakebusters are the only hands on reptiles parties or shows that allows people to hold the animals. All other less experienced outfits only do uninteresting "static displays" or boring "show and tell". 3 - The owner of Snakebusters is Australia's Snakeman, Raymond Hoser, Australia's undisputed leading reptile expert.